I must preface this that since I purchased my boat four years ago, I have had a great working relationship with the folks at Simex International – Marine Surveyors in Fort Lauderdale. It was the first time that I had purchased a boat so I needed somebody to help me with everything, and I mean everything. I was smart enough to have a pre-purchase inspection performed by Capt. Paul Squire before taking the proverbial plunge. He created a detailed report about the boat’s condition and what I should expect in the near future. I was so grateful for that. Of course, he also did the marine insurance evaluation survey for my insurance company. This was quite detailed as well. Everything went well since I purchased the boat. The few minor repairs that the marine surveyors suggested were handled as they suggested. We had been enjoying the boat pretty near every weekend until doomsday occurred. We were enjoying a lazy Saturday. My wife and daughter were sunbathing and my son was studying for his final exams. Being on the water is great for studying as there are minimal distractions. All of a sudden, I saw this idiot at full throttle heading toward the portside. I did my best to get out of the way, but the idiot slammed into us. Fortunately, he throttled back enough so he didn’t completely destroy the hull and sink us. But my heart did sink. I was so proud of having this boat. Even the family loved it. I didn’t want to deal with the inability to go out on the water whenever we wanted to do so. We had great family time. Anyway, I brought the dented vessel back to my slip and called the insurance company. Of course, they said that I needed a marine damage survey performed by an accredited marine surveyor in Fort Lauderdale. I immediately called Simex International – Marine Surveyors in Fort Lauderdale. Since it was the rainy season, I did have to wait a few days for the inspection to take place. This is understandable. Water and lightning don’t mix, and I wouldn’t want someone to be hurt or die inspecting my vessel. The Simex marine surveyor got straight to work after the storms and generated the marine damage survey for my insurance company. They promptly paid my claim and I got the green light from Simex on the final inspection. Capt. 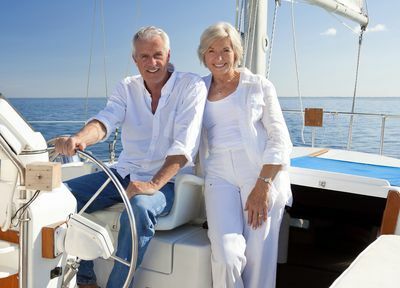 Paul Squire of Simex International – Marine Surveyors in Fort Lauderdale is the best guy to have on your side if you own any type of vessel. He is the epitome of information and honest as the day is long. I truly am grateful that he is on my side.